Please start this book by reading the genesis of it, in the Author’s Note as Laurel Snyder recalls the Seder gatherings of her childhood. Ms. Snyder, awaiting her serving of soup in that long ago Seder, wondered what it was like to be a child, among those fleeing in a mad rush into the desert, thousands of years ago? What was it like to be a child slave? And The Longest Night is her answer to that imagined question. If your child too, has such imaginings during the family gathering and celebration of Passover, perhaps this is a picture book to afford them one person’s imaginative take on what it must have been like, as seen through the eyes of a young one. Came another day like night. I built someone else a home. Sat and whittled in his chair. I sat too, and said a prayer. The theme of “waiting” expectantly fills this picture book, and it’s a feeling that young readers may identify with quite easily. Patience and trust are there also, as sometimes in life, one has to wait in a sort of patient endurance for the tide of life and circumstance to change, as we feel able to be sustained where we are, until the tide literally turns. Made a giant rushing sound. Change is in the air as the young girl senses they are running from something, yet also, to something new and different. Full of light and room to be. Pink above us gold and red. And artist, Catia Chen, has done a fine job in her illustrations of capturing the somber colors that reflect the mood of slavery, through the dogged endurance needed to survive the plagues, to the joyous rosy hues of freedom on the other side of the journey. 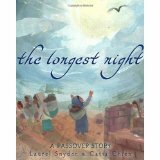 The Longest Night is a picture book history lesson of one of the oldest stories of patient endurance and trust, that led to victory. This dark-night-to-dawn story of a child enmeshed in an historic freedom walk event, is a fine introduction to the Passover journey for a young reader of any faith. It employs a sort of technique used in Bible Studies, where the reader is encouraged to imagine oneself in the biblical event, then try to sense what the sights, sounds and even smells of the event, might have felt like…to them. Ms. Snyder has offered this approach to fine effect, so that young readers, having read it, may sit down to their own Seder meal this Passover with a more personal take on events that occurred thousands of years ago, yet may be remembered, after this reading, with a more personal and reflective reverence, today.